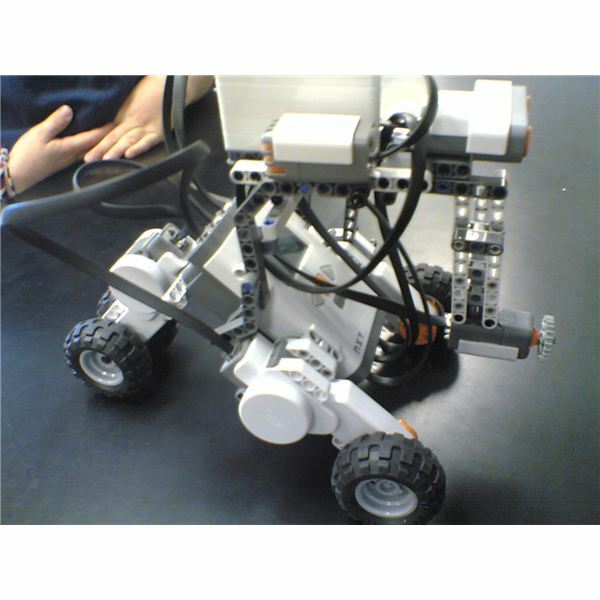 If the teams haven’t completed their robots from the first session, then they should be allowed to do so before continuing on to the next lesson- the skills of identifying and assembling parts and basic programming will be essential for all future sessions, and one of the most common construction errors is a simple misidentification of parts, followed by difficulty “reading” LEGO’s visual construction diagrams. When they are ready to move on, ask them what they learned in the first session- it would be ideal if you can post this in the room to serve as a reminder throughout the duration of the robotics project. By the end, your participants will know it by heart! Also, ask whether there were any structures that they built that seemed to work really well (or really poorly, for that matter). Be sure to emphasize that “failure” is a part of good science, because it gives us a chance to learn what really works/doesn’t work and, more importantly, why it works/doesn’t work. After recording their answers (or letting their team recorders do so), introduce them to a few real-world robots; the greater the variety, the better. My students have mentioned robotic vacuum cleaners, unmanned aerial vehicles/remotely operated vehicles, an alarm system, and a car- my own additions to that list include a robotic squirrel used for investigations into squirrel interactions and a computer-operated radio-controlled helicopter that learned how to fly from observing a human pilot. Even a dishwasher qualifies as a very limited robot! These examples reinforce the idea that robots are all around us and can do all sorts of tasks. For their next task, teams will spend a few minutes looking through the available robot designs in the Robo Center, then choose one of those designs to construct. If teams are particularly advanced, recommend that they modify a robot or add some of the accessories- they could turn the basic TriBot into a ClawBot, for instance. These options are also found in the Robo Center under the pertinent robot. While they are working on their robots, make sure that each team is keeping track of its parts and that each individual in the team has a responsibility to carry out. Encourage experimentation if teams are inclined that way. When they have finished constructing their robots, have them try out the basic programming skills they learned in the first session, noting if the different designs had any impact on how they had to go about programming their robots.